Canon have really pushed the boundaries on their tough cameras by increasing the integrity of the chassis. 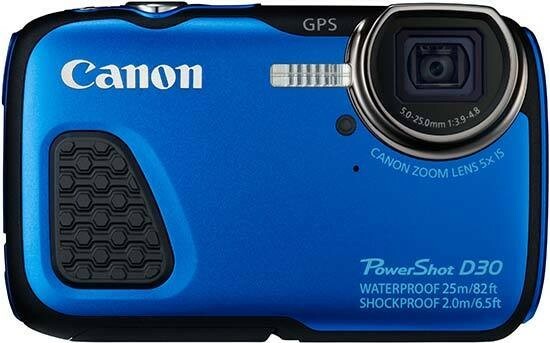 While the 2m drop is already matched in many tough cameras – and even bettered – the PowerShot D30 is unsurpassed in the depth that you can swim without an extra casing to protect the camera. It's certainly an easy camera to use as well, aside from the sneakier sub-menus that aren't immediately noticeable. The camera is very well laid out with the typical UI from Canon that makes it easy to make changes to functions without too much fuss. We like the way that the design has altered so much from the D10 camera. In 5 years, we've gone from a pebble shaped camera with an external zoom and submarine style rivets, to a pretty normal looking camera. Although they've plundered somewhat from the Olympus school of camera design, it's not exclusive to them and serves a purpose to make the PowerShot D30 flatter thanks to the internal zoom system. It's possible that the way the camera is constucted contributes to the chromatic aberration problems we saw in the Performance section of the review. The image has to go through a piece of glass before hitting the first lens, then bounces off a mirror to direct through the zoom lens elements which are at a right angle. The mirror and external glass could be the culprits in this, but it would be impossible to tell without dismantling the camera and testing it again sans glass and mirror. The image quality is of a good standard, though. Colours are punchy and aside from a little saturation being added, are true to life. It's interesting that Canon have been more reserved with their ISO availability. The maximum setting of ISO 3200 isn't the highest available on this type of camera, but we like to think that Canon have opted to retain an air of dignity and sacrificed consumer demand for maintaining their reputation for excellent image quality. The high ISO images do have their flaws, but if the PowerShot D30 had been allowed to rise to ISO 6400, then the Canon would have a bad show of performance. The Canon PowerShot D30 is priced a little lower than other cameras in this range. That makes it great value for money, but as a travel camera it is flawed due to the external battery charging unit. It does have a lot going for it, though, so if you can work your way around the charger issue, it's a good camera to have.